Another iPad keyboard is going to launch in the near future exclusively designed to cater iPad tablet users under the creation-inventor Steve Isaac. 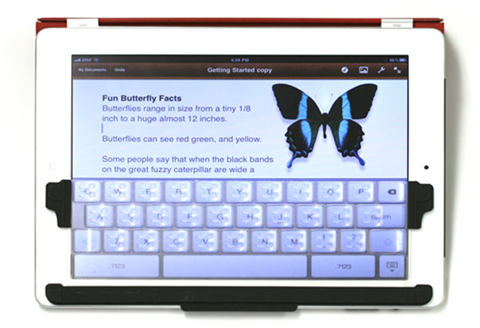 According to reports, the idea of Isaac started when he got his first iPad which later became his obsession to create a keyboard that will solve the tough use of on-screen keyboard for iPad (typing long email). His hard work paid off, when he convinced a mechanical engineer and designer Brad to merged with him with his project called as “TouchFire“. Though he met a lot of challenges with its design, he was still able to achieve a perfect match for Apple’s iPad keyboard. Brad describes the, TouchFire as a soft and ultra thin keyboard which is made of stretchy silicone. Each key has micro-structures to make sure user won’t feel a thing when typing. With regards to comfort, TouchFire maker considers it all. Like user can easily put on the TouchFire keyboard on-screen keys. And there will be no worries for accidental slips while in use since iPad has a built-in magnet to fit and secure the keyboard. To carry it together with an iPad is not bulky for it only weighs less an ounce while easy to fold and ultrathin size. The people behind the TouchFire are taking the final stages of awarding the rights of the manufacturing partner for its production plan. Ahhh talaga, bumalik na. Ok na daw sabi nila? Parang hndi ko masyado gusto ung ganito kasi touch screen na, dapat sanayin na lang ung kamay sa touch typing. Sir Dexter ang bilis mo magpost, dami agad.